Showing Items 1 thru 15. 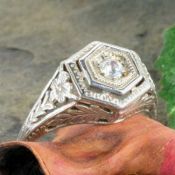 An antique style ring with a floral design and a 3.5mm .18ct cubic zirconia. Manufactured using a mold of the original antique hand carved die. Fits a 2.5mm round stone or .05 carat diamond. Sold as setting only, gemstone and sizing is optional. Cast per order in 10k yellow or white gold, 14k yellow, white or rose gold, 18k yellow or white gold, palladium or platinum. .17 carat diamond accent in an illusion setting. 4mm genuine ruby with .06cttw diamond accents. 4mm genuine emerald with .06cttw diamond accents. 4mm genuine sapphire with .06cttw diamond accents. 7x7mm princess cut swiss blue topaz, (2) 2mm iolites with .35cttw of diamonds. Gent's or ladies 4mm wide two tone band with a hand engraved vintage design. 5 to 5.5mm semi set engagement ring for a .50 carat round diamond (center stone not included) with .39cttw of trillion sapphire side stones and .07cttw diamond accents. Optional matching wedding band. 5 to 5.5mm semi set engagement ring for .50 carat round diamond (center stone is not included) with .28cttw of tapered baguette sapphires and .12cttw diamond accents. 5 to 5.5mm semi set engagement three stone ring for a .50 carat round diamond (center stone not included) with 4mm round sapphire accents.